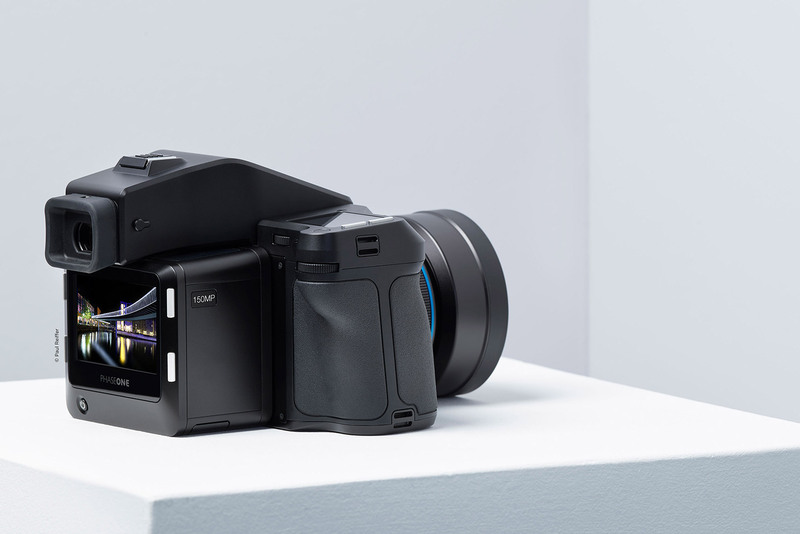 151 million pixels of pure medium format perfection, combined with the most advanced camera system in the world – all revealed inside today’s announcement and hardware release from the amazing guys at Phase One in Copenhagen. For sure, the IQ4 150MP tech specs are impressive: A Back Side-Illuminated (BSI) sensor capable of capturing unsurpassed levels of detail onto dual storage cards, coupled with lenses that can resolve incredible resolutions in a camera package that now harnesses the power of Capture One Pro within the system itself. All of this comes as part of their new “Infinity Platform”, which makes use of the existing XF Camera System and a whole heap of brand new technology in the XQD and USB-C enabled digital backs. So, how do you put it through its paces? 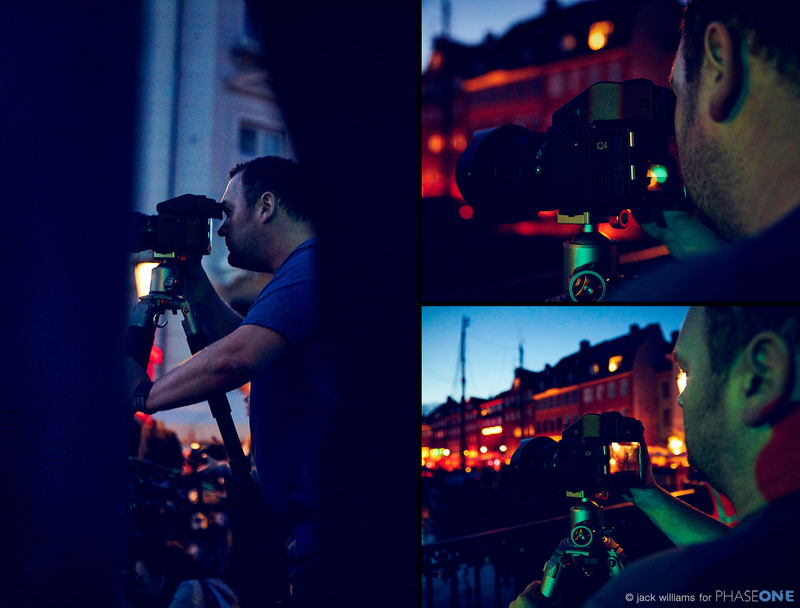 Well, you head out to Copenhagen with the Phase One guys to shoot their sample images for the launch campaign, of course! And I have just one word – WOW. 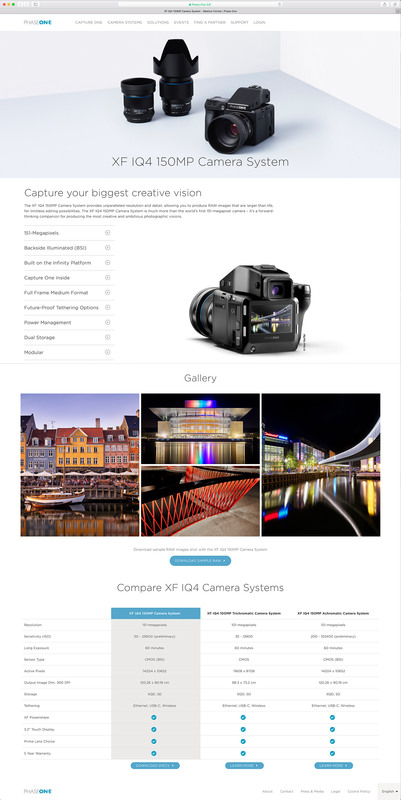 Phase One are not just celebrating the launch of the IQ4 Infinity Platform this year – they’re also looking back on their 25 year history of Danish development as they build all of that experience and knowledge into the system that, once again, resets the benchmark for image quality, detail and colour-accuracy. So what better way to celebrate that heritage than to use their home town, Copenhagen, as the backdrop for the sample images and hero shots of the system? 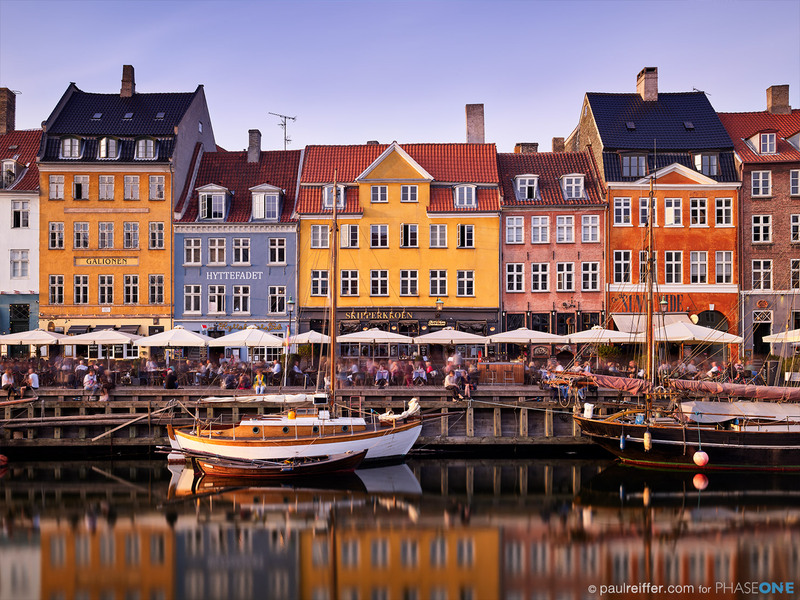 From the Royal Opera House (above) to the historic views of a truly charming city, this was about capturing Danish design with Danish engineering. Heading out to shoot a few of the most iconic (and busy) locations in town isn’t quite as easy as it sounds, when you’re working with a secret product that can’t be leaked ahead of launch! Luckily, with a crew around me, it felt like I had the place to myself, shooting a mix of historic buildings, modern design and world-famous views of this incredible city. So how did the IQ4 system handle all of these challenges? PERFECTLY, of course. 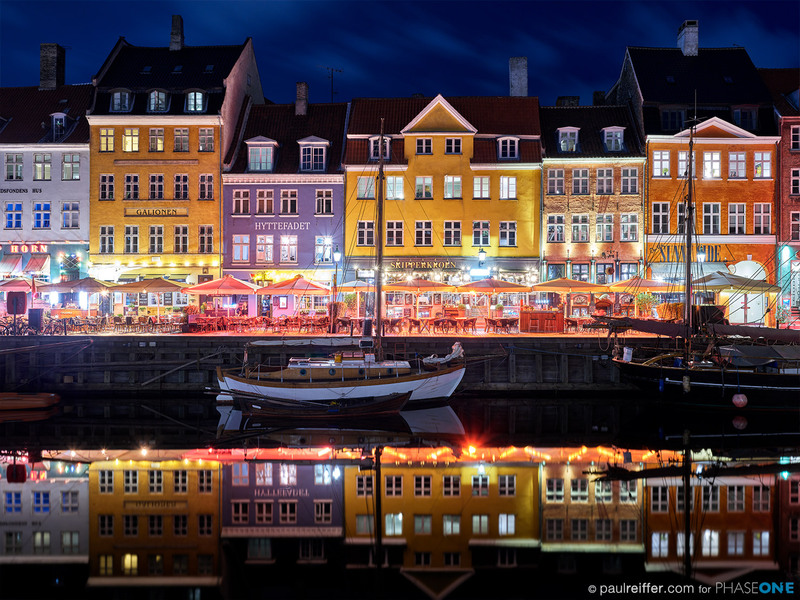 Nyhavn itself is one of the most photographed areas of Denmark, with architecture unique in both its character as well as its inability to hold a straight line in any direction you look – quite a challenge, but this was the shot to get. Initial testing in the day pointed to amazing levels of detail (as you’d expect from that sensor and the lenses), to the point where we simply had to come back in the evening to capture the area with the atmosphere that nighttime brings to a city. In my opinion, dynamic range is an often over-used tech spec – with the captains of industry constantly trying to out-do each other with X-stops or Y-stops, but none seem to deliver in the real world like my Phase One Medium Format cameras consistently do. Let’s take that image above – a most challenging setup with a range from pitch black to bright white – even my previous CCD Medium Format systems would have struggled to capture it all. Now, what if I made the point that this was a single shot, with no filter, at all? 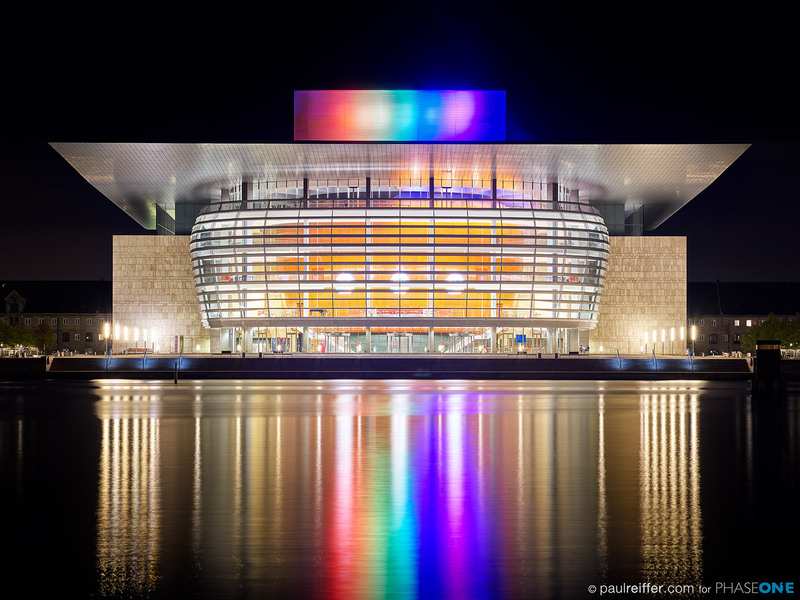 No “HDR tricks”, no middle GND, no luminosity masks – just a single shot from the Phase One IQ4 system – and that goes for the Opera House image, earlier on in this post, too. So why am I getting so excited about a new piece of high resolution silicon – is it simply because it now gives me the capability to capture 151,301,008 wonderful pixels of light? While printing BIG is what I do, that’s not the only reason, but let’s cover the sensor size first, starting with its physical attributes. Within the announcement today is also another clear statement – Phase One are focusing purely on full frame Medium Format technology. 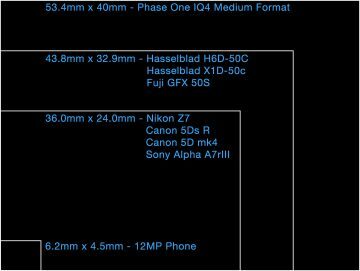 There’s been a recent influx of “pseudo medium format” cropped-sensor cameras – from Fuji’s GFX 50S to Hassleblad’s compact X1D-50c, and many more in the works – each using what I consider to be a loophole in the industry to claim that “anything bigger than 35mm is therefore Medium Format”. Medium Format is not just about resolution. …and while they’re all subtle differences, they combine to deliver a look that’s distinctive to that designation. My experience of changing from CCD to CMOS was really positive out in the field, with better high temperature and low-light performance, so could the switch to BSI sensors be a similar leap forward in imaging quality? On an FSI sensor, the light has to travel through all the circuitry and metalwork to get to the photo-sensitive part, meaning that a significant percentage is bounced back or lost – by flipping the silicon around (putting the circuitry behind it), the photo-sensitive part is able to capture almost all light that is received through the sensor lenses. Looking at it now, an FSI sensor would be like putting the windscreen wipers on the inside of your car, “because it’s easier”. So a completely logical move for the industry, with BSI sensors delivering around a 1/2 stop increase in light transmission over their traditional FSI counterparts. With Phase One now including the BSI 151 megapixel sensor, Trichromatic 101 megapixel sensor and the Achromatic 151 megapixel sensor in the new line-up, there really are infinite possibilities for every type of photography you can imagine. Yes, we can talk about levels of detail (the above are only 50% crops – the 100% crops are insane), but it’s the quality of the capture that gets me excited about this system all over again. That BSI sensor from Sony, with the amazing wizardry from the team at Phase One, come together within a platform which is (yet again) at the very forefront of imaging technology worldwide. And with Capture One inside, along with the potential for frame-averaging in the future (the beta versions look great…), this could become the camera that does away with ND filters when you want to get “that shot”. 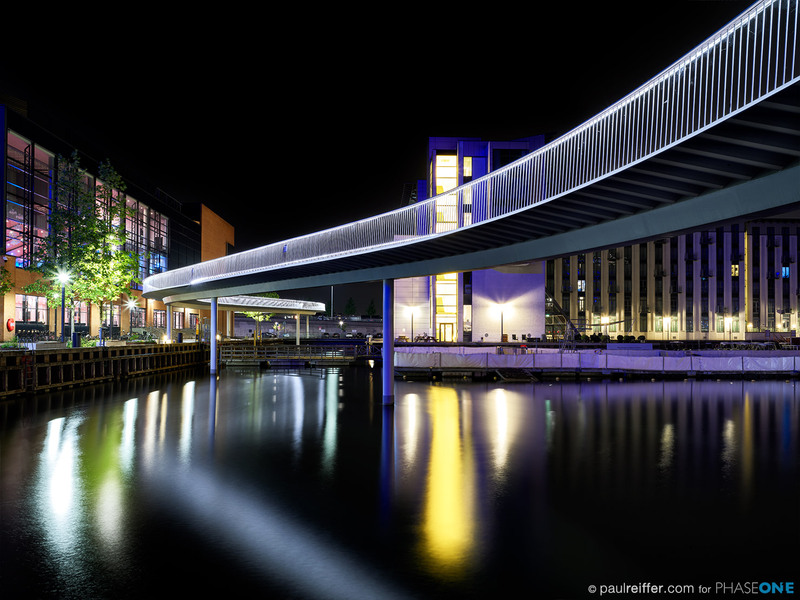 Finally, if ever I needed a way to really show how much detail those 151 million pixels collect, let’s go back to that hero image on the digital back itself – of the “Bicycle Snake Bridge” in Copenhagen. 10/10 to the Phase One guys – it’s been great working with them on this.